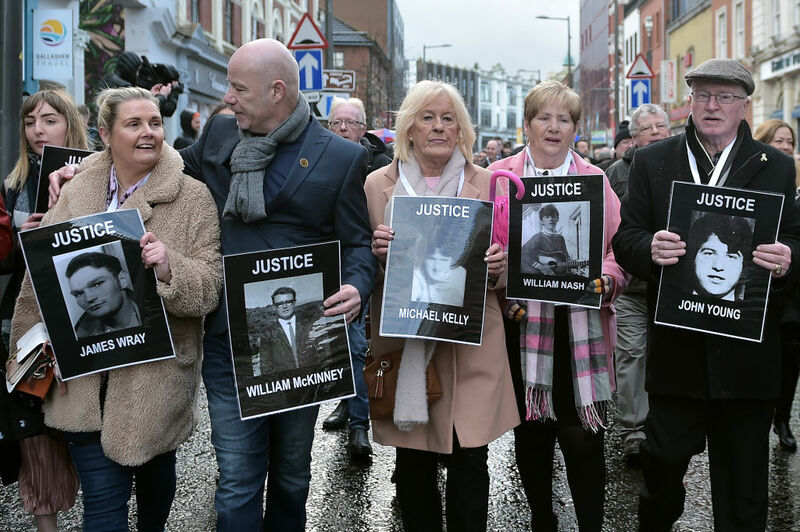 Just one former British soldier will face charges in the 1972 Bloody Sunday Massacre — a travesty of justice that comes amid a disturbing resurgence of nationalist jingoism in Brexit Britain. Numbers help make sense of some matters. On January 30, 1972 at 2:45 PM, between ten and fifteen thousand supporters of the Northern Ireland Civil Rights Association began a march protesting the British government’s policy of internment without trial. Marching towards the rally point, they were blocked by a British Army barrier. Many were forced down nearby streets, some protestors threw stones at soldiers, and at 3:55 PM soldiers opened fire. From the first to the last shot, a total of one hundred rounds of ammunition were fired. Thirteen people died that day, one more several months later, and fourteen more were injured. An inquiry commissioned in 1998 found that sixteen soldiers had used excessive force. Between that day and the decision on whether to charge the soldiers responsible, forty-seven years elapsed. One soldier was charged. With a trial now underway, some matters are sub judice, but the Saville Inquiry and the Police Prosecution Service for Northern Ireland have ascertained the facts of the day. The question hangs over whether the one person charged — the semi-anonymous “Soldier F” —merely killed, or instead murdered, the people who died at his hands that day. He will not be charged for at least two of the deaths for which he is responsible. Patrick Doherty was crawling away from the regiment when he was shot in the buttock, the bullet piercing his right flank. Rushing to his aid, Barney McGuigan waved a white handkerchief. Soldier F dropped to one knee and shot him through the head. Soldier F is not facing trial for murder for these two deaths because he is the only surviving witness. Statements from deceased witnesses are inadmissible to a murder trial. He will face trial for the murder of James Wray and William McKinney, who were both shot in the back, and the attempted murder of Patrick O’Donnell, Joseph Friel, Joe Mahon, and Michael Quinn, all of whom were injured on the day. The delay in justice played a key role in bringing about the fact that only one soldier was charged. Throughout the statement explaining the decision not to bring charges, the fact many witnesses were now dead was often the main impetus for not pursuing a murder charge. Essentially, Williamson has signaled that the government is fully backing Soldier F morally and financially, and sees his trial as an affront to British military operations. Very few British soldiers have ever been prosecuted for killing civilians. One could argue that to avoid “living in constant fear of prosecution” a soldier could adhere to the law and not kill unarmed citizens indiscriminately. Williamson clearly believes new measures are needed to prevent the prosecution of soldiers who are found to have repeatedly perjured themselves and killed unarmed civilians in future. His comments are outrageous, and victims’ families — fresh from the disappointment of seeing very little prospect of justice, with most soldiers not facing charges — have called for an investigation into his comments possibly prejudicing a trial. But it signals a marked shift in the attitudes of the Conservative Party that will only worsen. In 2010, responding to the Saville Inquiry, then Prime Minister David Cameron said, “I am deeply patriotic. I never want to believe anything bad about our country. I never want to call into question the behavior of our soldiers and our army, who I believe to be the finest in the world. And I have seen for myself the very difficult and dangerous circumstances in which we ask our soldiers to serve. But the conclusions of this report are absolutely clear. There is no doubt, there is nothing equivocal, there are no ambiguities. What happened on Bloody Sunday was both unjustified and unjustifiable. It was wrong.” His words are trite in their nationalism, but straightforwardly condemn the behavior of soldiers on the day. Williamson has rowed back on that, and it marks not a fork, but a continuation of the revival of jingoistic English nationalist exceptionalism. Knowing that the victims, and those who feel sympathy and express solidarity with the victims, will never be Tory voters, he jumps upon a vote-winning stance with scant regard for moral decency. This is a worrying fallout from the referendum on the European Union: the revival of ardent nationalism, rose-tinted misrepresentations of colonial history, and a refusal to engage with the genuine story of the United Kingdom’s creation and historical record. Nowhere is this more evident than in the attitude of many politicians and sections of the general public towards Ireland. Many have flippantly suggested that the Irish Republic “rejoin” Britain, refusing to accept the reality of the border and the importance of the Good Friday Agreement. The treatment of Bloody Sunday victims shows that Irish lives will always be seen as expendable in comparison to the legacy and valor of the dead soldiers who killed them. Families were told there was insufficient evidence to prosecute, having seen fourteen bodies pile up in Bogside. Soldiers were offered immunity if they told the truth and chose to lie rather than transmit the facts to the victims’ relatives and the historical record. And they have been fully supported by the government in doing so. The more obsessive side of the drive towards Brexit comes in large part from hard-line English nationalists; many of these are in government. Warning that peace in the North of Ireland is potentially jeopardized by Brexit matters little to them, because they have never cared about Ireland in any case. But that contempt for life extends to the rest of the country. Austerity is only possible when you are happy to starve people to keep the richest happier. The endless rhetorical call-backs to the Second World War and the height of colonialism show a morbid nationalistic preoccupation with a certain historical model of Britain, and thus a certain model of Britons. That necessitates a hierarchy of life, deciding which lives are worth protecting and which can simply be snuffed out without consequence. For many of those pushing this demented patriotism, Brexit is the opportunity to revive old colonial mindsets, setting Britain on course to start wars to compete culturally and economically. This is unlikely to end well for people of other nationalities in the UK: Brexit has seen a rise in reports of xenophobic and racist attacks and verbal taunts. The end point is violent, and as in Bloody Sunday, sometimes deadly. We are entering dangerous territory as we head out alone: those of us in England who aren’t English rightly have a lot to be concerned about with the growth of this resurgent jingoism and the rise of English cultural exceptionalism.